Schematic presentation of the lung structure and proximo-distal patterning inside. Lungs are the essential organs of gas exchange in the respiratory system. In humans, the lungs originate from the ventral forgut endoderm, which laterally gives rise to two primary bronchial buds, which then form two main stem bronchi. A. Lung structure. 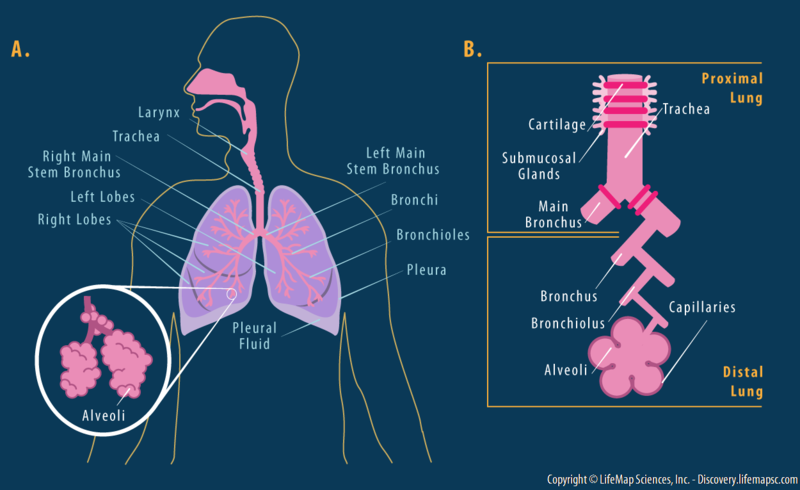 Through sequential branching, the main stem bronchi then sub-divide to form bronchi, bronchioles, alveolar ducts and alveoli. B. Proximo-distal patterning of the lung airways, which are comprised of the trachea, main bronchus, bronchi, bronchioles and alveoli.